But they do make seriously good toast. This toast was always an enormous treat when we went to stay with my Granny in her old Suffolk farmhouse. Located on an apple farm, her house was exactly the kind of place that suits an aga: the centre of a kitchen where milk could be heated for coffee, cakes baked for tea, plates warmed for dinner and a place for her two cats and dogs to lie in peace, toasting their fur in a long lazy stretch against the aga’s lower doors. Breakfast was always conducted in a formal manner. The butter came in a dish with its own knife, while an array of homemade jams were allocated a single silver spoon each. Milk was transferred from foil-capped bottles to a china jug, and if you wanted bread you had to apply for it from my Granny’s husband in his place at the end of the table. Toasting, however, was generally my Dad’s job: thick slices of fresh-cut bread sandwiched within their metal grill then transformed under hotplates into the most perfect toast in the world, crisp on the outside, soft in the middle, with lots of lovely little square ridges for soaking up extra melted butter. My Granny was always amazed at the amount of bread I could consume, raising her eyebrows ever so slightly along with her husband (my Grandfather died before I was born) as I requested yet another piece to put on my plate. But an army marches on its stomach, breakfast is the most important meal of the day and as a hungry little loaf I was happy to sit for hours enjoying my meal as my Dad read the paper, the dogs snuffling around our feet for crumbs. My Mum and brother, on the other hand, were always a little more eager for action when we visited my Granny. Every summer, after enough time sitting around the breakfast table to eat their fill, they’d announce their imminent departure to the local pick-your-own fruit farm. The door would slam, then with my Dad and I still barely out of our pajamas, they’d return, fingers sticky, stomachs full and punnets overflowing with freshly picked raspberries to eat, boil, bake and freeze for the coming months. That was a slightly long-winded way of saying this recipe is perfect if you have a surplus of slightly over-ripe raspberries to hand. A generous punnet’s-worth is stirred through a basic sponge batter, moistened slightly with ground almonds and baked until soft and sweet with jammy little pockets of juicy cooked fruit. Dark chocolate and raspberry is always a winning combination, so here I’ve topped these cupcakes with a chocolate ganache swirl, but if you want something simpler you could leave it out altogether. Served plain they’d even make a pretty good breakfast. Actually served with chocolate they’d make a pretty good breakfast too, as I discovered when baking these beauties before work the other day. Good enough to last until my next fix of aga toast anyway . . .
Preheat the oven to 175 degrees C. Line a 12 hole muffin tin with paper muffin or cupcake liners*. Place the butter, eggs, sugar, milk and almonds in a large bowl and beat with an electric whisk until smooth. Fold in the flour mixture and crushed raspberries, then divide the batter between your 12 cases. Bake for 20 – 25 minutes or until golden and just firm. Remove from the oven and allow to cool completely. Place your chopped chocolate in a large, heatproof bowl. Heat the cream in a small saucepan until it begins to bubble then pour over the chocolate. 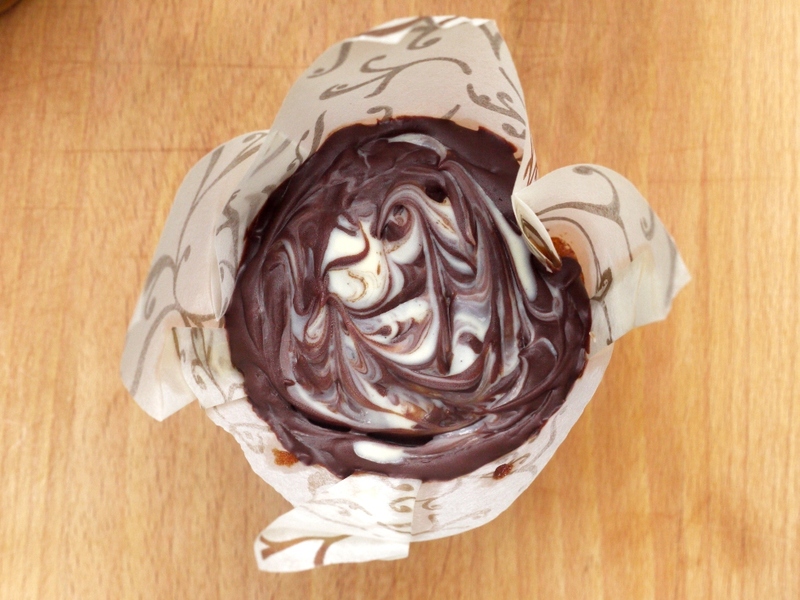 Leave for one minute then, using a rubber spatula, slowly bring the cream into the middle of the bowl from the sides, folding it over the chocolate until the mixture is smooth, combined and glossy. Set aside to cool and thicken for a few minutes, then divide equally between your twelve cupcakes, pouring the ganache over each cake then smoothing the top. Melt the white chocolate and drizzle over each cupcake. Using a toothpick or skewer, swirl the two chocolates together. Pop the cupcakes in the fridge for 20 minutes to set, but don’t store them there – the cakes will be happier and taste better at room temperature in an airtight tin. *For a more rustic look (as in my photos) use high sided muffin cases. 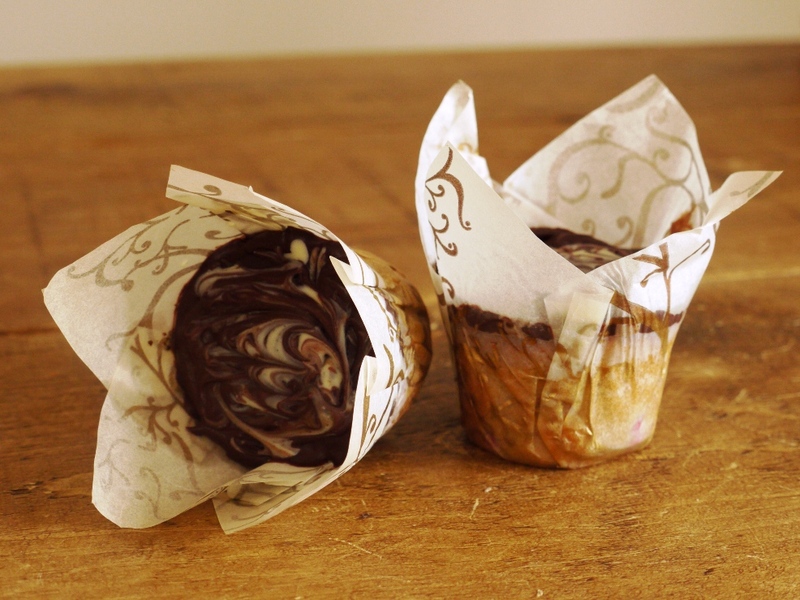 For a smooth, flat finish, use cupcake cases but you’ll need to judge the filling quite accurately to allow enough space for the ganache to sit on top once your cupcakes have baked and risen. You made these before work?! What time were you up? They look delicious, as always. These look gorgeous. I would totally eat them (with the chocolate ganache) for breakfast… and come to think of it, for lunch and dinner too! I love the memories you have from visiting your granny. This cupcakes are perfect for fresh raspberries and the ganache is the ultimate flavor combination! Love the paper you used. Emma – about 6am 🙂 I often don’t get time to bake in the week unless it’s early morning – plus licking the bowl for breakfast is pretty hard to beat! Connie – haha, let’s hear it for chocolate breakfast! Bianca – thank you. I got them from Lakeland. Paula – ah, thank you. Love the story behind these cupcakes. The swirl of dark chocolate ganache with white chocolate is so pretty. And yes, I agree that these would make for a pretty good breakfast! Bianca – thank you so much. Amy – yummy is the word! Dark chocolate and raspberry is a winning combination indeed! I tried it with bananas recently and they worked a treat. 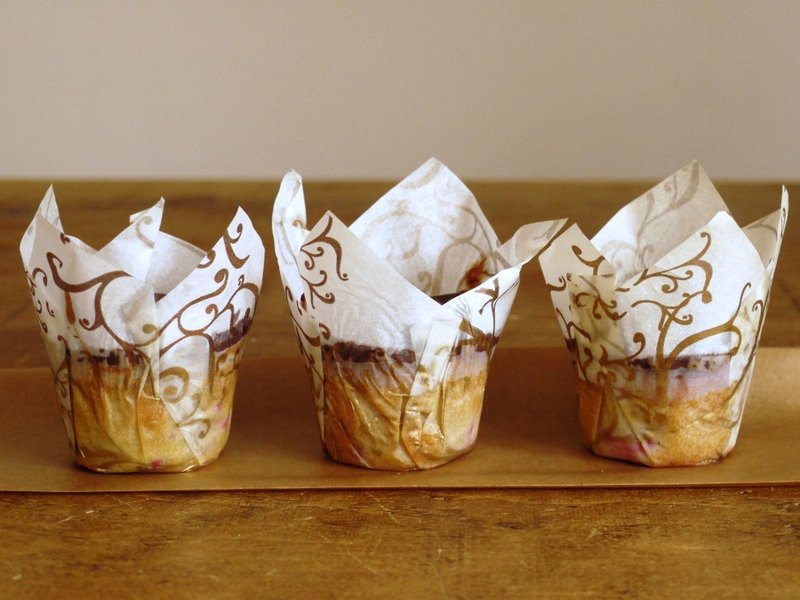 These look like good breakfast muffins too – love the use of muffin cases and the pretty swirls. These are so cute 😀 I love the raspberry colours thorughout. YUM! What a lovely post. And the cupcakes look great, too. I loved the memories shared and these cupcakes couldn’t look or sound more beautiful. Thank you for sharing with me. The raspberries, the almonds, the chocolate… It all just looks amazing. Definitely making these! Chocolate and raspberry! Mmmmmm! They look gorgeous! I love the cases too. 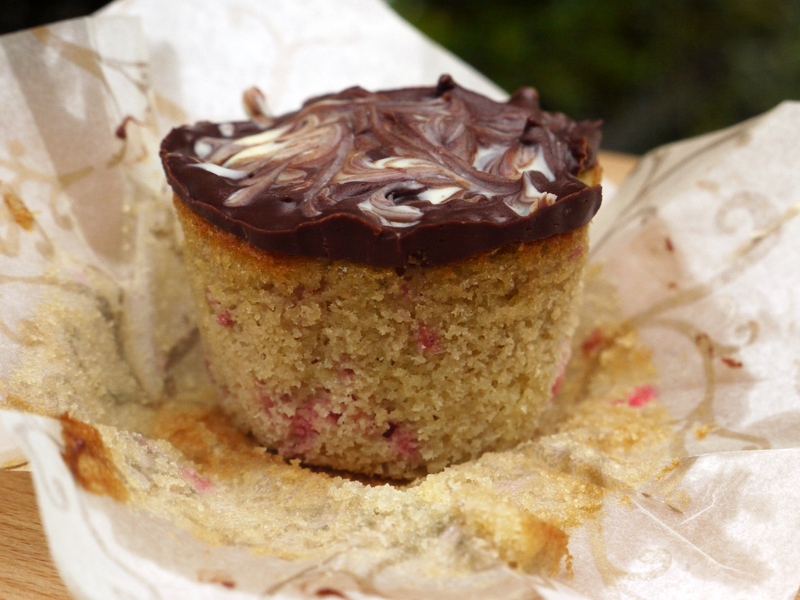 I’m all for chocolate for breakfast and well with raspberries….delicious! 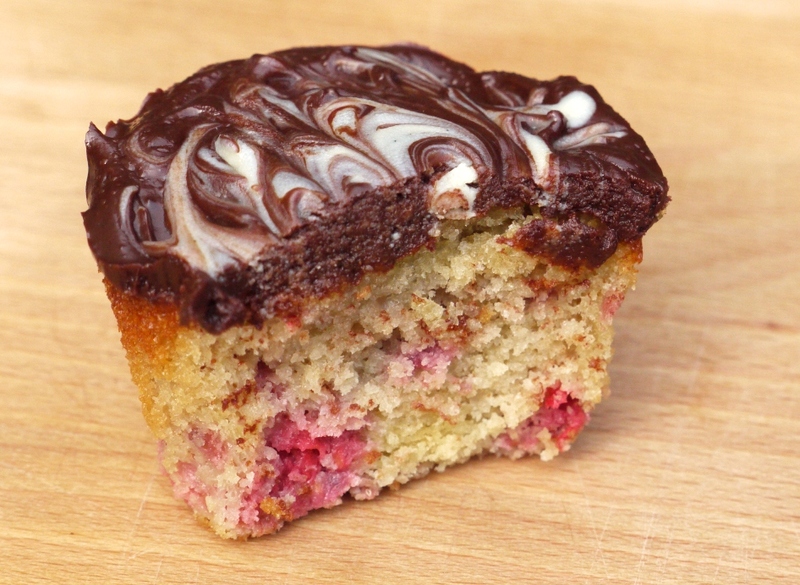 Oh lovely, this is exactly my kind of cake with the raspberries and ground almonds and, of course, that chocolate topping! Baking Addict – ooh, intrigued by the addition of banana, may have to try! Baking Beardy – haha I know, they are militant! Lottie – aren’t they cute? Kathryn – ooh I remember that raspberry almond cake you made, looked amazing!